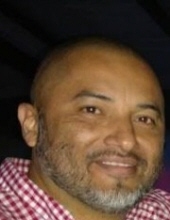 MICHAEL ANTHONY SANCHEZ, 44, a resident of San Marcos, Texas, passed away April 5, 2019. He was born October 9, 1974, in Lockhart, Texas, to Benito Jesus Sanchez, Sr. and Diana Hurtado. Michael grew up in Lockhart and after graduating from Lockhart High School he enrolled in the Austin Culinary Arts School where he earned his certification as a Chef. In 2007 he joined the team at Loan Express and quickly moved his way up to managerial position. Michael will always be remembered for his love of barbecuing which he took very seriously. He loved all sports and was an avid Dallas Cowboy fan. Michael was a member of the IBCA. Most dear to his heart was his family and friends and the numerous gatherings they shared. He will be missed by many. Michael is preceded in death by his Guardian Parents Eulalio and Anita Sanchez, Sr. and by his grandparents Julio Hurtado, Sr., and Oralia Hurtado. He is survived by his wife of twenty-two years Annette Rivas; children Zachary Michael Sanchez, Ryan Anthony Sanchez, Maribel Anilena Sanchez, Michael Marcus Sanchez; nine sisters; seven brothers; his grandchildren Hayden Sanchez and Haile Sanchez; and other loving relatives and many friends. Visitation will be held Thursday, April 11, 2019, from 4:00 p.m. to 9:00 p.m. at Thomason Funeral Home in San Marcos, Texas. A Prayer Service will be at 7:00 p.m. that evening. On Friday, April 12, 2019, there will be a brief gathering beginning at 8:00 a.m. at the funeral home before going in Funeral procession to Memory Lawn Memorial Park in Martindale, Texas. To plant a tree in memory of Michael Anthony SANCHEZ, please visit our Tribute Store. "Email Address" would like to share the life celebration of Michael Anthony SANCHEZ. Click on the "link" to go to share a favorite memory or leave a condolence message for the family.